I had all these great plans to blog this week and I just never found the time or energy. This week was month end and the stress and pressure was even heavier this month. I was working late each night but it wrapped up yesterday and I'm relieved. I collected close to $1.2 million this month and I think that's a record for me. Tuesday night I took Julie to her dance class and had 45 glorious minutes alone to read quietly. Wednesday night I joined a new study at my church called Freedom Session. It runs through to the Spring with a graduation at the end. I tried taking it last Fall but my emotions were so raw and I was just so empty. Everything in me was screaming GET OUT! GET OUT! I just couldn't go back. But this year I'm going to do it. I am carrying around a lot of junk in my heart that doesn't need to be there. I'm scared to pull it all out and deal with it, but my longing to be free is bigger than my fears. I've committed until Christmas, but have every hope of continuing on. Last night Ian and the big kids had youth group, so the littles and I walked to Mac's to get slushies. After we returned home and put Matt to bed, Jordan and I watched a movie together tucked in my bed. I love having that sweet time with her. She tells me I'm the best mom ever. Isn't that the sweetest? She has no frame of reference to determine that I am the best, but I am because she says so. I love it. 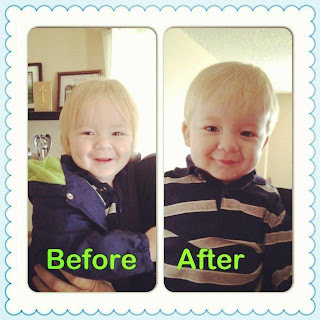 This morning I took Matthew to get his first haircut. Two thoughts ran through my mind as I held my little guy on my lap. The first was that I was watching his babyness disappear right in front of my eyes. The second was that I'd never seen anyone cut hair as fast as this guy did. Matthew was looking all around and squirming and this guy just went with it. He was all over Matthew's head at once, it seemed. He is ridiculously cute and loves hearing everyone telling him that today. This afternoon we're going over to my mom's to visit. My sister is visiting as well, so that will make it extra special. Sam is going to the mall to meet up with some friends for a bit, and Ian and the girls will meet up with him a little later to walk around together. Tonight is Family Movie Night and we're going to watch The Avengers. Thanksgiving is next weekend and I'm going to cook a turkey. I think I've only cooked two in my life but I had success each time. Hopefully this will be just as good. I'm going to get the kids involved and give everyone something to do so that when we're all sitting at the table at dinnertime, everyone will feel as though they contributed. I love Thanksgiving and I'm super excited that this year I can afford a turkey! I love how our lives have changed. God is good to us. Ok! 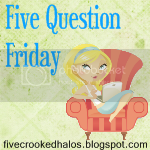 It's time for my sweet friend Mama M's Five Question Friday! I prefer to drive. That way there's no chance I might, you know, fall out of the sky or crash. I've seen LOST. I know what can happen. Aside from the whole crashing thing, I don't like flying because I'm terrified of heights and I'm claustrophobic. So when you put them together you get a freaked out Kate. Not to mention the luggage limit/losing my luggage, pat downs and scans at the airport. When I drive I can take what I want, get out when I want and I won't fall out of the sky. I'd like to live in Florida. I really like it there. I don't know. I guess it depends on how they're worn. If someone is wearing them as pants then no. But if you have a long sweater over them, I guess. I'm fashion-challenged. I just don't want to see butts. Cover them up, ladies. And remember, just because something fits doesn't mean it should be worn. No. I like the name Kate. It suits me and I don't meet a lot of other Kates around. My full name is Kathryn but I'm a Kate. Today's Parent and Chatelaine. I get them for a $1 each but seldom read them. But that doesn't stop me from getting excited when they arrive in the mail. Alright, I'm off to enjoy this beautiful Saturday. Have a great weekend! 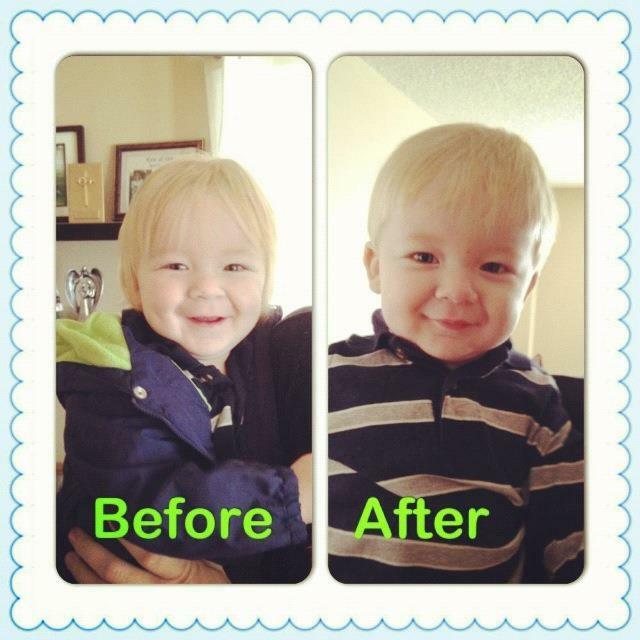 Posted by Kate at 11:54 a.m.
Awww... Cute picture of the boy! He looks great with the new haircut. Loved the Avengers! We saw it twice at the drive ins. We just saw Batman on Thursday night at free movie night. It was a bit dark and I've decided I like a little comedy mixed in with my super hero movies. My son liked both, but said he liked watching Hulk (in Avengers) just a little bit better. I like the name Kate too...I totally should've put that on my list. And, I am with ya sister *gives two fingered eye to eye manuever/gesture/whatever it is that indicates we see eye to eye* on the falling from the sky thing. Air France, anyone? Point made.